There are, I'm sure, lots of places where you can stand around in the street with a sign that says "Homosexuals are possessed by demons" and nobody will give you a funny look. West Philadelphia is not one of those places. 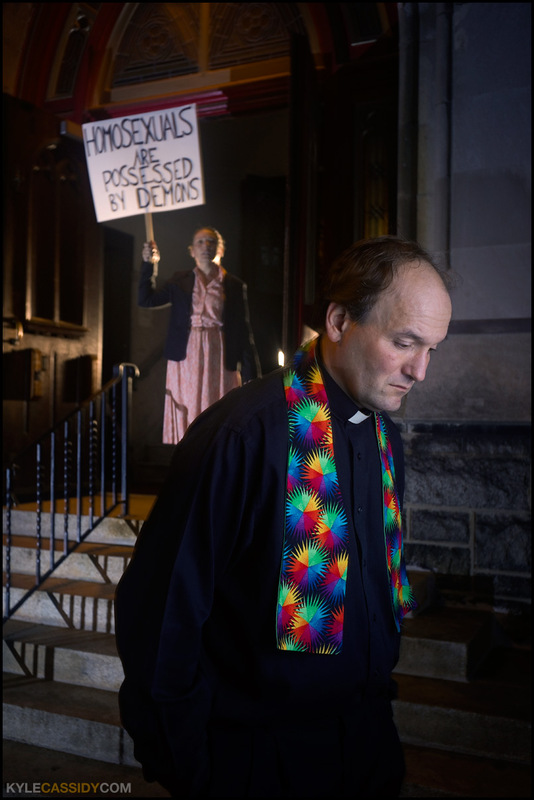 So you might imagine that in recreating some scenes from the upcoming Curio Theatre play "The Matter of Frank Schaefer" -- about a minister who was defrocked after he performed a wedding for his gay son -- we attracted quite a crowd of onlookers in the street. Frank's actions divided his congregation and his church and left a wound that's still open, friends & neighbors who no longer speak to one another and a court case that's as of yet unresolved. Initially I had more protesters in the photo, I wanted Frank to seem embattled. I tried it with various mixtures of supporter and detractors and ultimately decided that it looked best with one lone protester and Frank going home after a weary day. In any event, if you were trying to get home along Baltimore avenue on Saturday night but were prevented by a bunch of gawkers blocking the street -- sorry about that. Paul Khun as Frank Schaeffer. It's too bad I won't be in Philly for the show. I worked a lot on getting the word out about his trial for my previous job. Chances are high that there will be a video release of this one.